Today marks the 150th anniversary of the death of William Scott, the Groton farm boy-turned-soldier who was sentenced to death for falling asleep while on guard duty outside Washington. Some historians feel Vermont’s "sleeping sentinel" was the most famous private soldier to serve in the Civil War. In a story that has been told to Vermont school children for generations, Scott’s case drew the attention of President Abraham Lincoln. Scott was pardoned after he had been tied to a post to be shot. The reason: Before falling asleep, Scott had stayed up through the night to care for a sick comrade in an Army camp in the area. Seven months after he was pardoned, Scott was wounded in combat at Lee’s Mills, VA. He died the next day. A Readsboro math teacher has reached his goal of finding the gravesites of 78 men who enlisted to fight the Civil War with the Green Mountain Boys. 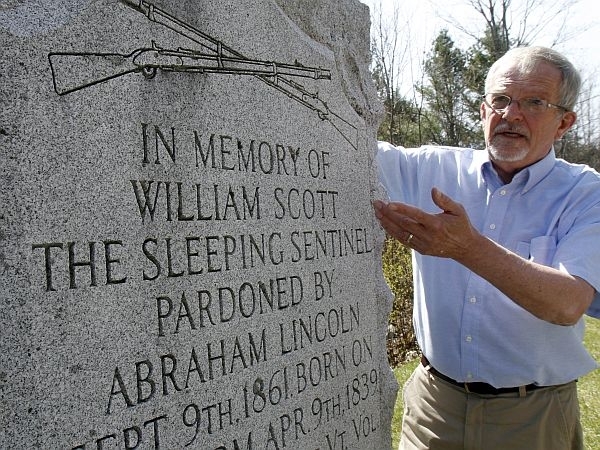 Civil War historian Howard Coffin relates the story of the Sleeping Sentinel, an update on the Vermont Legislature and we listen back to the voices in the news this week.